Jonan Island Seaside Park (城南島海浜公園, jonanjimakaihinkoen) is a seaside park with artificial beach and camping area. This park is the only camping spot in Tokyo Metro. At the beach, you can enjoy clam capturing. There is also fishing spot on north side of the park. 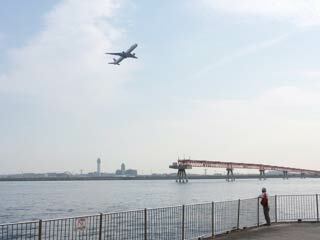 Because it is located right next to Haneda Airport, many airplane lovers visit here to watch and photograph their landing and taking off. There is parking, restroom and shops. Skateboard ground and camping field are closed on Wednesday. Camping required the reservation. Don't capture small size of clams. Maximum amount of clam you can capture is 2kg. Tsubasa Beach - Clam capturing. No swiming, no fireworks, no fishing. Camping field - One day BBQ, overnight camping.